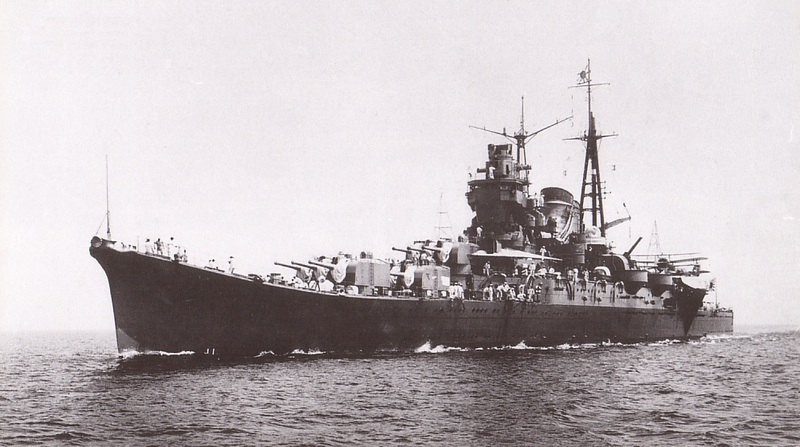 Cruiser Mogami in 1939 as originally armed with 15.5 cm guns. Developed as a Dual Purpose gun for the "B" class cruisers of the Mogami and Tone classes, these guns were later removed from the former class and replaced with 20 cm (8") No. 2 guns when they were reconstructed in the late 1930s. The turrets were then reused on the Yamato class battleships and the Oyodo class light cruisers as well as in coastal batteries. The slow rate of fire and limited elevation of these guns made them unsuitable for the AA role, but they were an excellent anti-ship weapon. In an effort to reduce dispersion, turrets 3 and 4 on the Mogami class "were integrated with the superstructure deck. This arrangement subjected the barbettes to powerful internal stresses, which at times caused the turrets to jam. For example, during the official gun trials of Mogami, turrets  and  could not be trained. It eventually proved possible to solve this problem by simply improving the method of fixing the barbette structure to the ship's hull." - Hans Lengerer in "Warship Volume VII" article. These modifications resulted in considerably tighter patterns than those achieved by the 20 cm cruisers. A triple turret was mounted at Kure and another at Sasebo for AA purposes and two guns on single mountings were used for coastal defense in the Tokyo area. Construction was of the monobloc type with autofretting and used a Welin breech-block mechanism which could be operated either hydraulically or by hand. A total of approximately 80 guns were manufactured at Kure. ^The theoretical rate of fire was 7 rounds per minute, but this was not achieved in practice. The shell hoists could supply a maximum of six rounds per minute but the powder hoists could supply no more than five bags per minute. "Naval Weapons of World War Two" says that "the rate of fire did not exceed five rounds a minute" which agrees with "US Naval Technical Mission to Japan report O-47(N)-1". ^Besides the those projectile types listed above, there were also an Exercise training projectile along with a lighter charge of 30 DC propellant (weight unavailable) for firing it. ^Type 91 shells were all 6 / [infinity] crh with boat tail and two copper driving bands. The diameter of the bourrelet was 6.07 in (15.418 cm). These 15.5 cm (6.1") Type 91 shells were not true "APC" projectiles as they lacked a cap, having only a cap head and windshield. Weight of cap head and windshield is not available. There were true APC projectiles, designated as Type 91 Mod 1, but these were used only for armor penetration experiments and were not in service. ^It is reported in US Naval Technical Mission to Japan report O-19 that Type 91 AP projectiles for these guns had not been in production since about 1935 as the conversion of the Mogami class cruisers had left large stocks on hand. Although O-19 seems to state that AP projectiles were not carried by capital ships, the Yamato's ammunition expenditure log for 24 - 26 October 1944 shows that she expended 127 rounds of Type 91 AP during that time along with 383 Type 0 Common rounds. ^Common Type 0 HE was supplied with time fuzes for AA defense. US Naval Technical Mission to Japan report O-19 says that this round had an effective radius of 25.2 yards (23 m) but this seems to be optimistic. ^Illumination rounds introduced in 1938 and these were rated at 950,000 candle power and had a maximum range of 23,600 yards (21,580 m). ^The propellant charge was in one bag with a 2.6 oz (75 gm) black powder igniter. ^The muzzle velocity is occasionally quoted as high as 3,215 fps (980 mps), but Japanese sources give the lower values used above. Even at these lower values, the barrel life was quite short. During maneuvers in August 1938 Mikuma fired several salvos at about 21,870 yards (20,000 m) and achieved a mean dispersion of about 304 yards (278 m), much tighter than the patterns achieved by the "A" cruisers armed with 20 cm/50 (8") Type No. 2 guns. ^The AA Ceiling figure for 75 degrees quoted above is a theoretical value based upon the original mounting design. The illumination round had a maximum range of 23,600 yards (21,600 m). This data is from "Japanese Cruisers of the Pacific War" and refers to NVNC plate. ^These mountings generally resembled the 20 cm (8") twin mount adapted for holding three guns. To reduce lateral spacing, the breech for the center gun opened upwards at a 45 degree angle, the weight being balanced by springs. 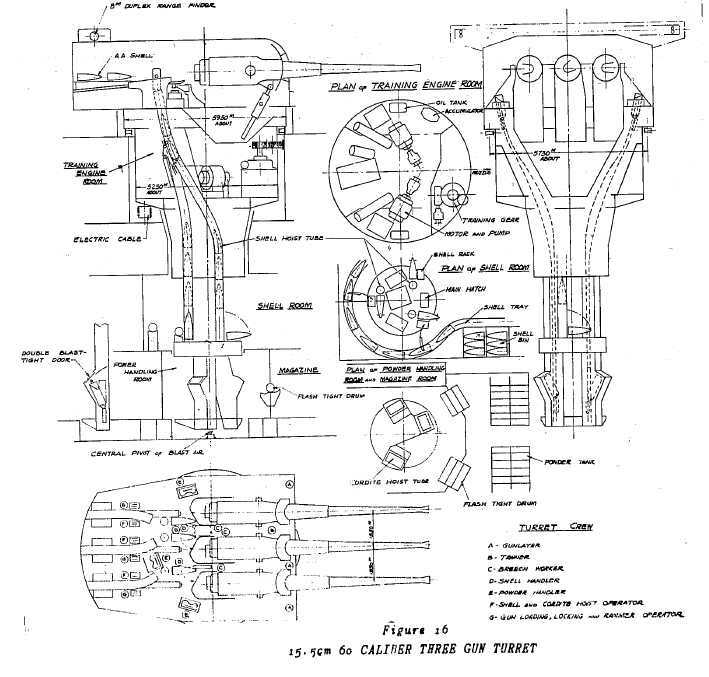 The guns were originally intended to have a +75 degree maximum elevation for AA fire, but analysis showed that their slow elevation and depression speeds with a fixed angle loading system coupled with the inefficient hoist supply would have meant that the firing rate would be too low to be effective. In addition, this high of an elevation would have overstressed the somewhat delicate recoil and elevating mechanisms, similar to the problems found with the 20 cm (8") mountings. For these reasons, the final design limited elevation to +55 degrees. ^The mountings were operated by electro-hydraulic pressure with mineral oil used as the pressure medium. Each mounting had two 100 hp electric motors, each driving a hydraulic pump located outside of the turret in order to reduce noise. Normally, one motor was in use while the other was in standby. Each gun had its own shell hoist and powder hoist. Projectiles were brought from the shell rooms to a circular track around the base of the revolving structure and then placed into pusher shell hoists that delivered them directly to the gunhouse at a rate of six a minute. The shell hoists came up to the right of the left gun breech and to the left of the other two guns. Powder bags were brought from the magazines through flashtight drums into a powder handling room. The bags were then delivered through double flashtight doors to bucket hoists similar in design to those for the 20 cm mountings. These bags were delivered at a rate of five per minute to the gunhouse. Hoists were hydraulically powered by the ring main. Projectiles were hydraulically rammed first, and then the powder bags were manually loaded into the breech and then hydraulically rammed. Ready-use AA shells were stowed in the rear of the gunhouse. 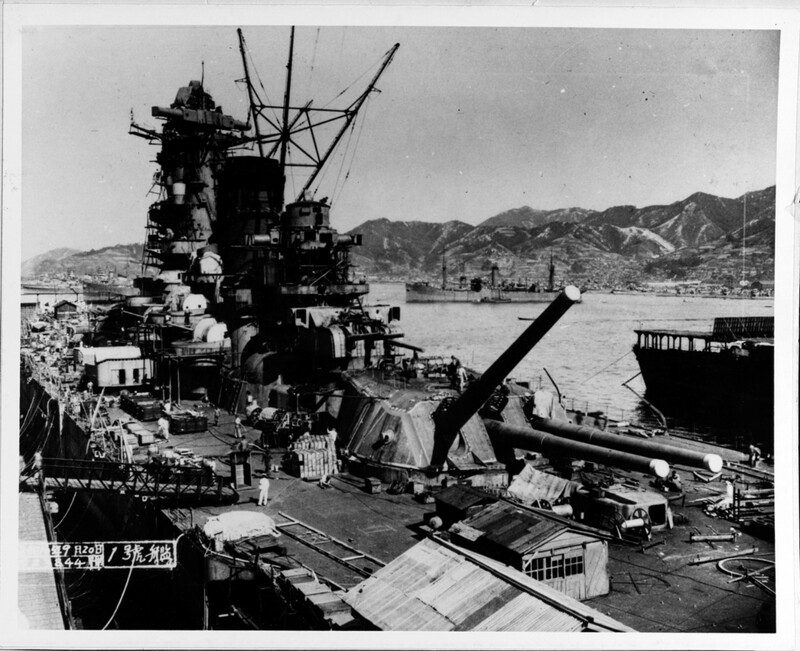 ^Yamato and Musashi had their two amidships mounts removed in 1944. Yamato had these replaced with twelve additional 12.7 cm/40 (5") AA guns. It had been planned that Musashi would be similarly rearmed, but the additional 12.7 cm mountings were not available prior to her loss. ^4.14.2The Yamato and Oyodo classes reused the mountings removed from the Mogami class. The 15.5 cm turrets removed from Mogami were found after the war in a warehouse on Eta Jima. ^The weight figure above is for mountings without rangefinders. Weight with rangefinders is not available, but I would estimate that these would have added about 5 tons (5.1 mt) to the mounting. ^Guns were individually sleeved. It had originally been planned that the elevation rate would be 16 degrees per minute to aid in AA fire but this was reduced to 10 degrees per minute in service. Complement per mounting was twenty-four officers and men in the gunhouse, seven men in the shell room and ten men in the powder room. Thin steel lagging used around most of the gunhouse provided about a 10 cm (3.9 in) air space which shaded the mount for tropical service. Protection was 25 mm (1.0") NVNC-steel plates on the front, sides, back and roof. The gun axes were 61 in (155 cm) apart. Battleship Yamato under construction in September 1941. Note that the 15.5 cm (6.1") mounting was superfiring over the 46 cm (18.1") mounting and that the guns were individually sleeved. U.S. Naval Historical Center Photograph # NH 63433. Cruiser Oyodo in June 1943. Oyodo had two triple 15.5 cm mounts on the bow and seaplane facilities on the stern as originally completed. Note the 10 cm AA guns amidships. U.S. Naval Historical Center Photograph # NH 90532. Rare overhead view of cruiser Oyodo in September 1943 when she was at Truk. Note the sunshades over the 15.5 cm (6.1") turrets. Photograph from the collection of Hans Lengerer. Triple 15.5 cm Mounting. Sketch from "US Naval Technical Mission to Japan report O-47(N)-1: Japanese Naval Guns and Mounts-Article 1, Mounts Under 18". 15.5 cm Type 0 Common Projectile. "Battleships: Axis and Neutral Battleships in World War II" by W.H. Garzke, Jr. and R.O. Dulin, Jr. US Naval Technical Mission to Japan report O-47(N)-1: Japanese Naval Guns and Mounts-Article 1, Mounts Under 18"